Filipino workers on two different types of visas — highly skilled and seasonal — have faced restrictions recently. 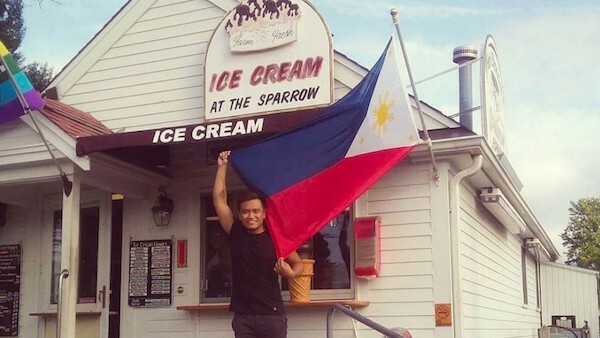 In this photo, Rayben Tamayo stands in front of the ice cream shop where he works during the summer on Cape Cod, but may not be able to this year. Credit: Courtesy Yolanda Tomayo via The World. More than 200 years ago a group of slaves fled the U.S. for Mexico, forming a small community of about 60 families known as the Mascogos, reports The Washington Post. Now, many are migrating to the U.S. because of a lack of work and extreme drought. “The history of the Mascogos reflects the long view on human migration, the way a community can be pushed and pulled across borders over centuries, eventually returning to the place from which they fled,” writes Kevin Sieff. In Guanajuato, Mexico, a younger generation who saw their fathers and grandfathers leave behind their country to find work in the U.S. are making plans to build careers and families in Mexico, a trend that could have a drastic impact on the economy in Texas (and other states) that have relied on undocumented labor for years. Trump issued his first presidential veto on Friday after Congress rejected his declaration of a national emergency at the border. An estimated $12.9 billion in funding for 400 military construction projects across 40 states could be diverted to pay for a border wall, which could hurt local economies and push politicians to consider overriding Trump’s national security veto, reports Axios. DHS Secretary Kirstjen Nielsen said the administration predicts CBP could apprehend as many as 100,000 migrants at the border by the end of March 2019, the most in one month since 2007. One possible explanation for the increase in Central American migrants, particularly from Guatemala, is a new tactic used by Mexican smugglers to take Guatemalan migrants to the U.S. border on express buses in a matter of days, according to U.S. government documents revealed to The Washington Post. This smuggling method helps avoid the risk of extortion, kidnapping and sexual violence in Mexico. Seventy-nine migrants have died in Latin America since the beginning of February, surpassing the Mediterranean as the most dangerous migrant route, reports Voice of America. Even without secured funding, border wall plans have continued in Texas, where the government has requested access to more than 570 properties to survey for potential construction, reports NPR. Others are already deconstructing the existing wall. Between 15 to 20 people in Tijuana have been arrested for stealing the concertina wire along the U.S.-Mexico border to put outside their own homes or buildings, reports The San Diego Union-Tribune. The Trump administration initiative to return asylum seekers to Mexico while they await hearing dates has hit more glitches, resulting in a judge refusing to deport four men who did not appear because they were unaware of their court dates, reports AP. “Government documents had no street address for the four men in Tijuana and indicated that correspondence was to be sent to U.S. Customs and Border Protection,” Elliot Spigot writes. In the first six weeks of the program, 240 migrants were sent back to Tijuana from San Diego. The government plans to expand the initiative widely as part of an effort to reduce the courts backlog. Three Central American asylum seekers made to wait in Mexico told a U.S. immigration judge Tuesday that they fear for their lives in Mexico and requested to be allowed to stay in the U.S., reports Reuters. Reports of extortion by Mexican authorities have been increasing as the number of Central American asylum seekers has increased, particularly in Reynosa. Some of those apprehended are Mexican citizens and one detainee described it as a “legal kidnapping,” reports KRGV. The Supreme Court ruled Tuesday that the government can detain immigrants with a criminal record at any time after they have been released from prison. The court’s four dissenting judges argued this violates the constitution by detaining people indefinitely without cause and imprisoning people who have already served a prison sentence, reports Vox. The federal government has been holding kids in clandestine shelters without notifying lawyers, a potential violation of rules, reports Reveal. Minors with mental health challenges were originally placed in known shelters and then transferred to “off-the-books facilities.” “It remains unclear how many total sites are under operation, but there are at least five in Arkansas, Florida, Oklahoma, Pennsylvania and Virginia, holding at least 16 boys and girls for the refugee agency, some as young as 9 years old,” write Aura Bogado and Patrick Michels. The Office of Refugee Resettlement kept a spreadsheet to document the pregnancies of unaccompanied minors in an effort to systematically deny them abortions while the agency was under the direction of anti-abortion activist Scott Lloyd, reports MSNBC. Vice News and Mother Jones have also reported on efforts to prevent migrants from accessing abortions while in detention even though they have a right to the procedure under U.S. law. A Mexican migrant died in U.S. custody on Monday, after showing flu-like symptoms and signs of liver and renal failure, reports BuzzFeed News. The unidentified man is the fourth migrant to die in U.S. custody in recent months as officials continue to face scrutiny for the conditions in detention. ICE has refused to release a 72-year-old Mexican immigrant with Alzheimer’s to his family, despite concerns that the unfamiliar environment is detrimental to his health, reports The Daily Beast. The agency said that it does not have a policy for these cases, but instead decides them on an individual basis. El Paso holds more detainees than any other public jail system in Texas, reports The Appeal and The Intercept. Some of them are being illegally held far beyond their release dates, and one man has retained civil rights lawyers and is suing the county for holding him for 46 days. Homeland Security Investigations “broke up an international movie piracy ring, returned the hand of an ancient mummy to Egypt and helped arrest the world’s biggest drug kingpin, Joaquin ‘El Chapo’ Guzman,” writes Brittny Mejia in the LA Times. But they are worried that being a branch of ICE is deterring their efficacy. In particular, sanctuary policies have caused a breakdown of cooperation between local authorities and Homeland Security Investigations, even though their work often does not include immigrants. At least four more immigration lawyers and one journalist have reported being questioned by officials in Arizona and Texas, reports NBC. The practice was previously believed to be unique to San Diego. In addition, Religion News Service reports that a Christian pastor from New York was sent to secondary inspection when she crossed into the U.S. from Mexico in January after spending time with the migrant caravans. The pastor’s name and photo, with an X through it, appeared on documents leaked to the media leading some to believe religious and faith leaders are also the targets of increased scrutiny. An increase in indigenous Guatemalan migrants seeking asylum who speak languages like K’iche’ or Mam has overwhelmed an already overloaded immigration system without enough translators to handle the influx, reports The New York Times. “Mam, K’iche’ and Q’anjob’al — all indigenous to Guatemala — have each become one of the 25 most common languages spoken in immigration court in the past few years,” writes Jennifer Medina. “With migrants who cannot understand or be understood, lawyers and immigration experts say, there is no way to ensure fairness in court.” In December, the Justice Department instructed immigration judges to use phone interpreters for all languages besides Spanish, leading to delays in hearings and lack of clarity, reports The Marshall Project. The American Bar Association released a report finding “the immigration courts are facing an existential crisis,” and that “the current system is irredeemably dysfunctional and on the brink of collapse,” reports CNN. The Association proposes creating a court separate from the Justice Department and modeled after tax or bankruptcy courts. A growing number of Americans want immigration levels to remain the same or to increase according to the 2018 General Social Survey released this week, reports AP. Meanwhile, the percent of Republicans that want less immigration decreased to 52 percent in 2018 from 62 percent two years earlier. The U.S. Special Envoy to Venezuela, Elliot Abrams, wants to grant temporary protected status to an estimated 70,000 Venezuelans living in the U.S. to pressure the Venezuelan government, but other high-level administration officials oppose the move because it contradicts Trump’s crackdown on immigration, reports The Wall Street Journal. Filipino teachers were recruited to cities like Baltimore more than a decade ago because of a shortage of American teachers. But last year, after Trump launched the “Buy American and Hire American” program to reassess the H-1B visas for highly skilled workers, many were forced to pack up homes and families and return to the Philippines, reports The Washington Post. Since then, the city has launched a campaign on behalf of the teachers and succeeded in helping almost all of them return. Filipinos have also been one of the top recipients of H-2B seasonal visas — until this year. In January, the Trump administration determined that they are no longer eligible to apply, blaming a high overstay rate and human trafficking. The World spends time with workers from an ice cream shop in Cape Cod whose owner is desperate for help and feels the decision is unfair.